The Pride Outlander XL Exterior Lift can be ordered with either a lock-down arm designed for securing scooters or a set of ratcheting straps than can secure a power chair or scooter. The Outlander XL is extra long and designed to carry large scooters and power chairs. 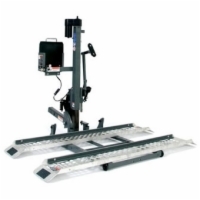 Standard features, of this lift, include a license plate holder, adjustable wheel chocks, and a manual override. Every Pride Outlander lift we sell comes standard with a battery pack so that you don't have to worry about wiring the lift to your vehicle's battery.